Single moms are absolute rockstars. I have a lot of love and admiration for them as they do it all every single day! My guest Sarah Bettencourt is an inspiration and shares with us how she thrives as a single mom financially. Sarah grew up in a Lutheran town in Seattle. With this lifestyle came an old-school view on money; no one really spoke about it. Sarah only started to understand money during college, where she obtained student debt from loans and credit cards. During her last year of school, Sarah got pregnant. This pushed her to determine a way to successfully pay off her debt while raising a child. To do so, Sarah learnt how to establish herself as a business owner by working with an agency, growing their social media department, and leaving to be a full-time entrepreneur. She has now been a successful business owner for three years and counting. Sarah had to understand where she was financially in order to pay off her debt. She started by using not only her school counsellors, but also the financial counsellors at USAA. There she received a run down of where her debt was, how much it was, and how long it would take to pay it off. Following the print out she received and her grandmother’s wisdom to always pay bills on time, Sarah made her debt a priority. She used a google excel spreadsheet to map out what she needed to made, her income, her personal/lifestyle expenses, and her spending habits. This allowed her to make necessary cuts in order to successfully pay off her debt and build her business as a single mom. Sarah’s biggest piece of advice is to save money like everything will fail tomorrow. This way, if your business suffers a slow month, you will not have to skip student loan payments, credit card payments, or any of your other monthly bills. Sarah only realized the importance of a savings account when her business expenses increased last year due to her business expanding. Since then, Sarah makes sure to save 10% of her monthly income in a separate emergency account. In the past, Sarah suffered issues with drug addiction. She changed her life when she quit cold-turkey in her 20th year. She then started to supplement her addiction with coffee and shopping. To this day Sarah still struggles with extra spending, but having her emergency savings account helps her manage her struggles. Sarah also has accountability buddies: her mother and father. By discussing her difficulties with her parents, Sarah is able to keep her mind in check, and provide a good life for her son. Sarah states that her best money spent is on speech therapy for her son, Fox, and other mental therapists. Fox was recently diagnosed with high functioning autism, and the skills he receives from his speech therapy are things Sarah could not teach him herself. Through his therapy Fox is able to successfully communicate with Sarah, and he has a better quality of life because of it. Mental therapy helps Sarah check-in with someone other than her parents, and allows her to face her past. Sarah believes mental health is of the utmost importance. Sarah’s proudest money moment was the day she payed off her $6000 credit card debt in her 21st year all on her own. Most of the debt was a product of her drug addiction and her other demons. Paying off that debt was a huge relief for Sarah. Debt is not just a financial burden, it is a physical burden too. Part of Sarah’s addiction was fuelled by the tree of her debt; paying it off was the beginning of her healing process from her addiction. Sarah’s most influential mentors were her grandparents. Her grandfather helped her take out her first student loan, and helped her keep her spending habits in check. Sarah’s Grandmother always reminded her to pay bills on time, or call the credit card company to figure out how to pay her bills when the month was tight. 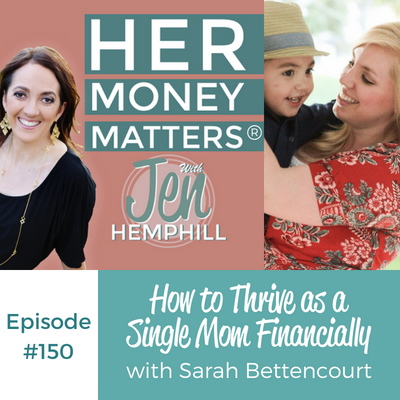 The post, HMM 150: How to Thrive as a Single Mom Financially With Sarah Bettencourt appeared first on the Her Money Matters Podcast.